Happy Saturday, everyone! Thank goodness it's the weekend, right? Tonight, I'm heading to see Maroon 5 in concert for the 56th time and of course, needed to rock some awesome nails. I've actually be wearing these since Thursday because they doubled as Valentine's Day Nails. The lead guitarist's name is James VALENTINE, so they were twice as appropriate for this reason. For those of you following me on Facebook, you may have read about my disappointing incident regarding Macy's Herald Square and the Adam Levine appearance to celebrate the launch of his 222 Fragrance. To put it simply, I was given bad information when I called the store after the appearance was announced, relied on it, and was unable to get a pass as a result. And, considering I had spent 2+ hours on these nails, plus got up extra early and traveled into NYC on a non-school day, I was more than a little upset. But the good news is I'll still be heading into Madison Square Garden tonight to see the band play, along with Neon Trees. I'm disregarding the fact that I'll have to suffer through Owlcity for the fifth time. Oh, they are AWFUL live. Rule of thumb: If you need a wind machine and you're a solo artist, there's a problem. Anyway, this was my second attempt at a sequin manicure. 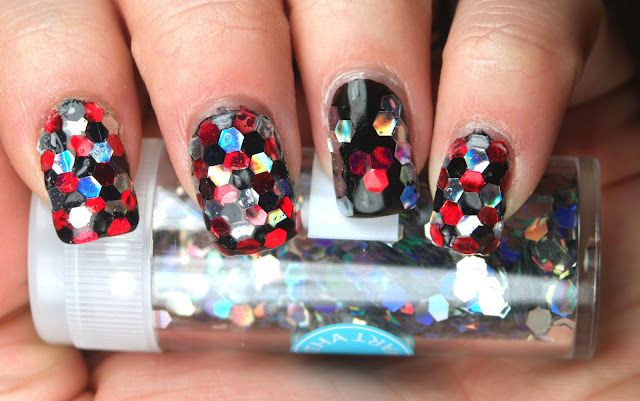 I used hexagonal glitter I bought at Michael's for $10 with a coupon. The set has twelve different colors, but I only used the red, black, and silver. I painted on coat of Rimmel Black Satin on each nail (two coats on the ring finger). Then I applied top coat in small sections of each nail as I went to make sure it didn't dry before I could stick on a sequin. I trimmed down some pieces of glitter to fit them to the tip and applied a coat of Seche Vite to the whole nail as soon as I stuck on the last piece. Doing the Maroon 5 logo on the ring fingers was the easiest part! In order to pick up the sequins, I let a drop of top coat on a paper plate dry until it was tacky, pressed the tiniest dotting end I had against it, and used that to pick up/place sequins. Oh, it was a pain! In the end, I was really happy with how it came out. It was tedious as heck to alternate the red, black, and silver like I did. It needed about four coats of Seche Vite in order to smooth it out to the point where it wasn't snagging on everything I own. Consequently, I had a bit of an issue with bubbles in the top coat, but it isn't noticeable outside of macro shot. I love how crazy sparkly this is. And the colors are that vivid in real life. It's starting to fade a little now because the top coat seems to eat away at the seal on the sequins, so this won't last much longer than a few days. I can't imagine doing two full hands again, unless I was guaranteed the chance to meet Adam down the road. But I could easily see myself using this technique for an accent nail! How about you all? Would you attempt this yourself? Did this manicure "rock" your world? I promise I'll share some pics on here tomorrow. Be sure to follow my Instagram for all of the photos I take at the concert tonight!